Cardigan town lies within the medieval Cantref Iscoed, in the commote of Is-Hirwern. Ceredigion, including Cantref Iscoed, was briefly brought under Anglo-Norman control between 1110 and 1136, under the de Clare earls, who built a castle at Cardigan on a hillock overlooking the Teifi. A castle had already been established during an earlier incursion, in 1093, but was short-lived. It is usually thought to be represented by the earthwork at Old Castle Farm, but it could have been located at the present castle site. Anglo-Norman control in Cantref Iscoed was brought to an abrupt end in 1136, when Welsh forces won a decisive victory at Crug Mawr, 3km northeast of the town. Ceredigion remained in Welsh hands throughout the 12th and 13th centuries, until finally annexed by the English crown in 1283, when the county of Cardiganshire was created. However, Cardigan itself held out against the Welsh until 1164. It is recorded that the Welsh prince Rhys ap Gruffudd after gaing Cardigan immediately rebuilt the castle in stone, although the scant remains visible today appear, in the main, to be late 13th century. Rhys’ sons relinquished Cardigan to the Norman King John in 1201 when it became the centre of a royal lordship, which corresponded to Is-Hirwern commote. A further period of Welsh rule followed in 1215-1223, but otherwise Cardigan remained in the hands of the English Crown for the remainder of the rest of the medieval period. 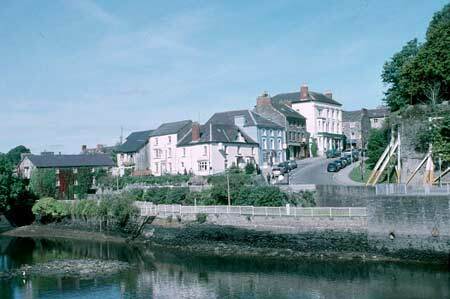 The origins of the town, which later became a borough, are generally thought to belong to the period 1110-1136, as is the construction of a bridge over the Teifi, and the foundation of St Mary’s Church as a Benedictine priory, to the east of the town. It was also the parish church, survived the Dissolution to remain the parish church until the present day.. It has a fine 14th century chancel, and a west tower that was rebuilt in 1748. A further chapelry, now gone, was established near the southern end of the town bridge, after a visit by the Archbishop of Canterbury in 1188. A weekly market was held from the mid 12th century until the early 20th century. Although many burgess privileges had been granted the town was not formally recognised as a borough until 1284, when it received its first charter. The town wall was constructed during the 1240s when the English Crown extensively rebuilt the castle, although the defensive line may already have been in existence. The medieval street-pattern has survived, but little of the town wall, which was already becoming ruinous in 1610. The walls enclosed 4.3 ha, taking in High and Bridge Streets, and their side streets between the Afon Mwldan and the priory. The population of the town increased from 128 burgages in 1274 to 172 in 1308. The borough was incorporated in the early 16th century, with a mayor and corporation, and the grant of further privileges. The castle became the administrative centre for the County of Cardiganshire, which was created in 1284, but this role came to an end with the Act of Union of 1536. It was neglected, and by 1610 was ruinous. It saw action in 1644-5 during the Civil War when it was damaged and taken by Parliamentary forces. John Bowen acquired it by 1810 and began converting it into a mansion and landscaping the interior. It was occupied until the end of the 20th century. Consolidation of the ruins is due to commence shortly. The town contracted during the late medieval period. There are only 55 houses recorded in the mid 16th century, while it was ‘ruinous and decayed’.In 1610, Speed’s map showing extensive open areas, and only one mill still existed of the three recorded on the Afon Mwldan in the 13th century. However, from 1536 onwards, Cardigan became the county town, which may have given impetus for growth - Speed’s map also shows extensive extra-mural suburbs to the north, and especially to the east of the town wall. The County Assizes were held in the town from 1536, a shire hall was built in 1764, and a County Gaol built by John Nash, in 1793, to the north of the town. Cardigan was a seaport from the first, and maritime trade - which underwent a revival from the 17th century onwards - also contributed to the redevelopment within the medieval town and the expansion of the suburbs. The Port of Cardigan had jurisdiction over Newport, Fishguard, Aberaeron, Aberporth and Newquay during the 18th and 19th centuries, with a combined fleet, in 1833, of 291 registered vessels. Ship-building was also an important occupation, but its decline had begun by c.1800. The quay was located immediately west of the Afon Mwldan. The town was involved in considerable coastal trade, as well as some foreign trade, exporting oats, butter, oak bark, and - especially from the late 19th century onwards - locally-quarried slate. The town was supplied with piped water in 1831 from a reservoir on the northern edge of the town, and a number of new places-of-worship had been established by 1833. A brickworks had been established in Cardigan, by William Woodward, by the 1870s. Development took place to the north of the medieval town, along the turnpike road to Aberystwyth (now the A487(T)), which already comprised ‘shops, and few good houses’ in the early 19th century. This development is shown on the tithe map of c.1840, which also shows a small secondary development at Netpool, and about 10 buildings south of Cardigan Bridge. Apart from these developments the town had the town had not expanded outside the its boundraries depicted by Speed in c.1610. A further boost to Cardigan’s trade, industry and growth came when the Whitland-Cardigan railway was incorporated in 1869 (closing in the 1960s), with its station on the southern bank of the Teifi. A substantial suburb developed here. However, subsequent development has mainly occurred north of the town, with rows of good-quality late 19th - early 20th century terraces, and villas, either side of the A487(T) and B4548. Schools, and a hospital, were established during the 20th century. The main maritime industries rapidly declined during the early 20th century, although coastal herring fishing, and a salmon fishery on the Teifi - including coracle fishing - were undertaken into the middle of the 20th century. The town is now a regional administration centre, with tourism and leisure playing an important role in its economy. 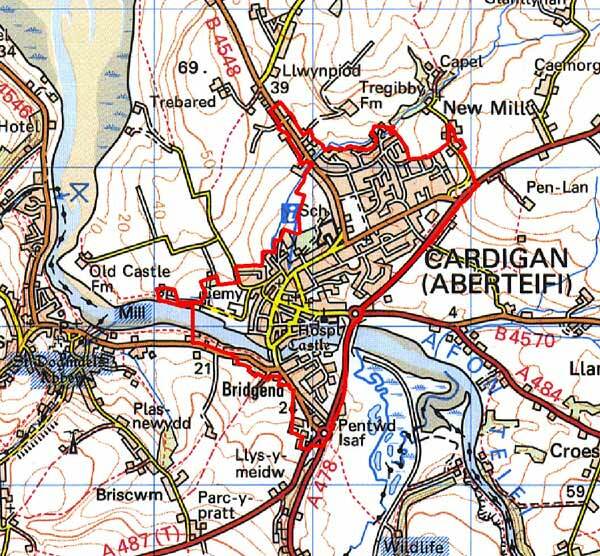 Cardigan is a complex urban historic landscape character area lying mainly on gently sloping south-facing land on the north bank of the Afon Teifi, but including a smaller but nevertheless substantial component on the opposite bank. Older elements of the town are mainly confined within the circuit of the medieval town walls (now almost entirely gone), with a focus on the remains of the medieval castle and bridge at the southern end of the High Street. The medieval urban topography of the High Street, and St Mary’s Street leading to the parish church located a little distance to the east of the walled town, is perpetuated in the modern town plan. Mid to late 19th century development, mostly housing, lies along North Road, to the east towards St Mary’s Church and on the south bank of the river across the early 18th century stone bridge. Extensive 20th century (mostly later 20th century) housing and commercial development lies further out to the north and south. Teifi valley slate is the principal building material in the older buildings – the medieval remains of Cardigan Castle, the medieval St Mary’s Church and Cardigan Bridge – and was used down to the end of the 19th century. On better quality buildings it is cut and coursed, but is uncoursed rubble on many structures. It is assumed that the cement render, common on many buildings, covers rubble. Banded Teifi valley slate in conjunction with squared, warm brown stone (Dolerite?) is used on some buildings; it is particularly noticeable on the three-storey early to mid 19th century warehouses close to the river. A couple of late 18th century buildings survive, but most stone-built domestic and commercial properties date to the early to mid 19th century. Numerous two-and three-storeyed Georgian style buildings are present (most are listed), but most, though generally in the Georgian tradition are relatively small terraced houses. Within the confines of the medieval town it is usual to find these terraces made up of buildings of different styles and dates – the available space for building dictated by the medieval burgage plots. Outside the medieval town single-build terraces are more common. The 18th century brick-built Black Lion is unusual, if not unique, in southwest Wales as brick was not commonly used until the late 19th century. The opening of a brickworks at Cardigan in the late 19th century marked the decline of stone. Brick buildings are particularly evident along North Road, many displaying moulded designs and period details such as gothic and classically inspired architectural details. Some of these are listed, as are brick-built shops/commercial premises in the town centre. Cement rendering probably covers many smaller domestic brick-built buildings. North Wales slate is used on roofs of stone-built and brick buildings. Early 20th century development along North Road includes several substantial, pebbledashed, detached villas with towers, turrets and red tile roofs, as well as more modest semi-detached suburban style housing. Substantial later 20th century housing estates in a variety of styles and materials and commercial and light industrial development lie on the fringes of the historic town core. 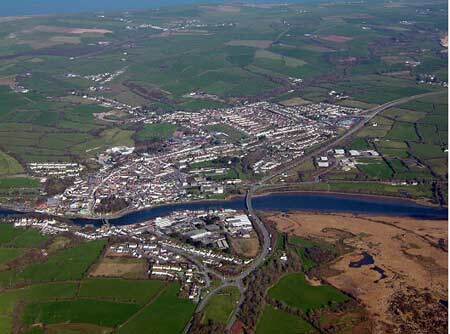 The urban character of Cardigan distinguishes it from the surrounding areas of fields and farms.